Confabula Rasa is now … and then we died! …and then we died is now available for purchase! Snag a copy here. Featured in the Indie MEGABOOTH at PAX East and PAX West 2018. 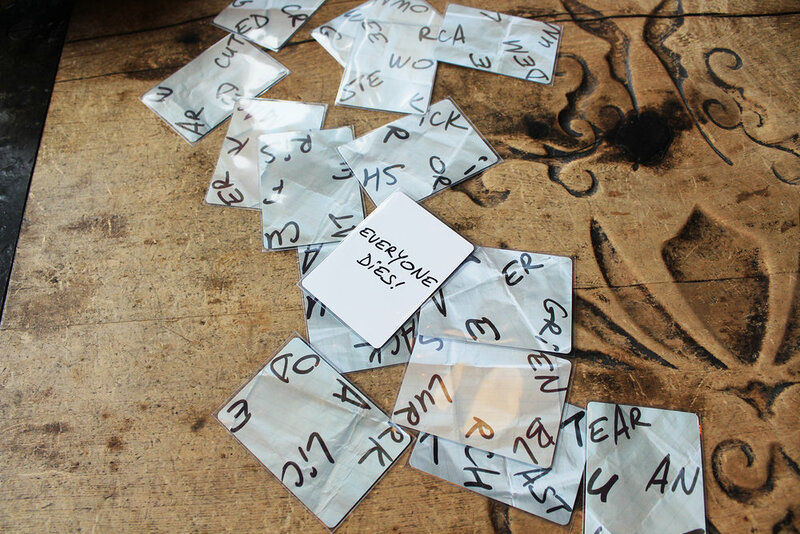 …and then we died is a storytelling game for two to eight players featuring a deck of word fragment cards. You play as ghosts trying to figure out how you died so you can pass on to the other side. Receive the hottest ...and then we died news. Give each player a double-sided word fragment card. Place one card in the center of the table. Take seven of the remaining cards, shuffle them, and put them on a pile on top of the Everyone Dies! card. (For a shorter intro game, use three cards instead of seven). Any player may start play. The first player places the card from their hand onto the table so that it forms a word using one or more letters from the card already on the table. The player may place their card adjacent, on top, or slide their card underneath, as long as the card(s) on the table are not shuffled around. 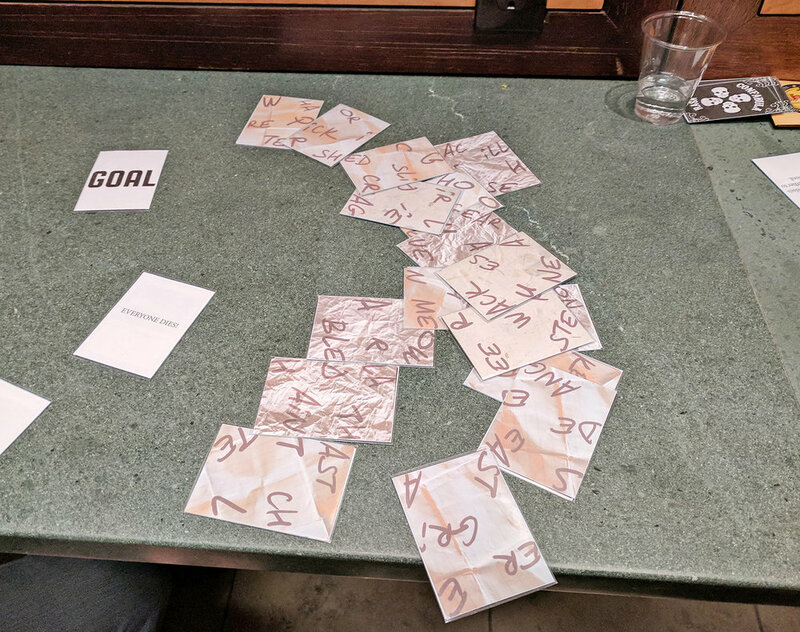 When the first player has formed a word, they draw a word fragment card from the pile and point to another player. The player pointed to must start to tell the story of the death of the ghosts from the ghosts’ point of view, incorporating the word that was just made. For example, if the first player forms the word “cat,” the pointed-to player could say: “I remember we were hanging out with a cat and petting its belly.” Once the player has finished speaking, any other player may go next. The next player adds a card to the pile on the table to form a new word and points to another player to continue the story. This is a cooperative game in which players tell a story based on the words they make with their word fragment cards. It’s okay if a created word is made up or spelled incorrectly - the goal is to let the story flow. It’s up to the player who made the word to explain it if others are unsure of the meaning. Embrace an improv mentality - use “yes, and” liberally with your fellow ghosts. The inspiration behind the game is "anyone can be a storyteller!" Check out the word fragmentizer I wrote in Java to split my creepy words into one, two, and three letter chunks.